Conjoined twin boys born in Florida last month are said to be doing well after undergoing surgery to begin their path to separation. Carter and Conner Mirabal were born Dec. 12, connected at the chest and abdomen. The surgery on Friday was to separate their small intestine. CBS affiliate WJAX reports that the babies are breathing on their own, and their mother was able to see the twins Monday morning. "They're doing wonderful," the twins' mother, Michelle Brantley, said. "They are breathing on their own and doing wonderful. We're holding up really good and taking it day by day." Doctors at Wolfson Children's Hospital and Baptist Medical Centers in Jacksonville are optimistic that the boys can be fully separated when they get a bit older. Doctors say the twins each have a separate liver, but the organs are fused together. Surgeons discovered during Friday's operation that the twins also share a bile duct. Carter and Conner will remain at Wolfson Children's Hospital for the next six months, when their next surgery is scheduled. The doctors want the babies to grow as much as possible before the operation. The family posted an update on their Facebook page Sunday, saying the babies were doing well and asking the public for prayers. Post by Prayers for Carter & Conner. Conjoined twins are the result of one fertilized egg that divides into two fetuses that fail to fully separate. 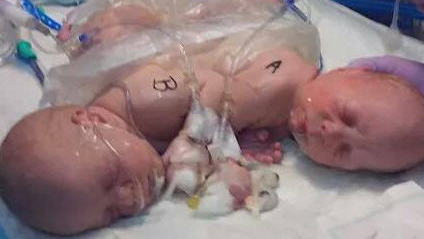 Conjoined twins are extremely rare, occurring in about one of every 200,000 deliveries. Of those, only about 35 percent survive survive past their first day in the world. Carter and Conner are what's known as omphalopagus twins, joined at the abdomen, which statistically has the highest survival rate.